Games for the Weekend: Bang! It is that time of the moment, my Games for the Weekend! This week I have a real crowd pleaser and quickly become a party favorite in my house. I only discovered this game at a friend’s behest for me to check out the game. This weekend’s game is the spaghetti western know as Bang! Bang! 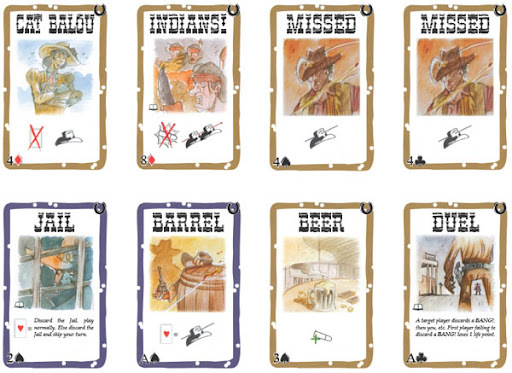 is a card game that recreates the feel of being in wild west shootout. It is you versus the other players in a shootout. However, there is one problem; no one knows who each other is. Well you know who the Sheriff is but that is little consolidation for the Sheriff when he does not know who his deputy is. Bang is as much a card game as it is a deduction game, one where you have to figure out who is who, with each person’s role dictating what they will do in the game. Bang! is card game where players take the one of five possible roles, each with their own goals. The Sheriff, Deputy, Outlaws and the Renegade. The Sheriff must kill the Outlaws and Renegade. The Deputy needs to protect the Sheriff and help him kill the Outlaws and Renegade. The Outlaws want the Sheriff dead and does not care who gets in their way. The Renegade wants everyone dead so he can become the new Sheriff. Players utilize their card hand to bring their individual goal to fruition. The goal of the game is to achieve your role’s motive. 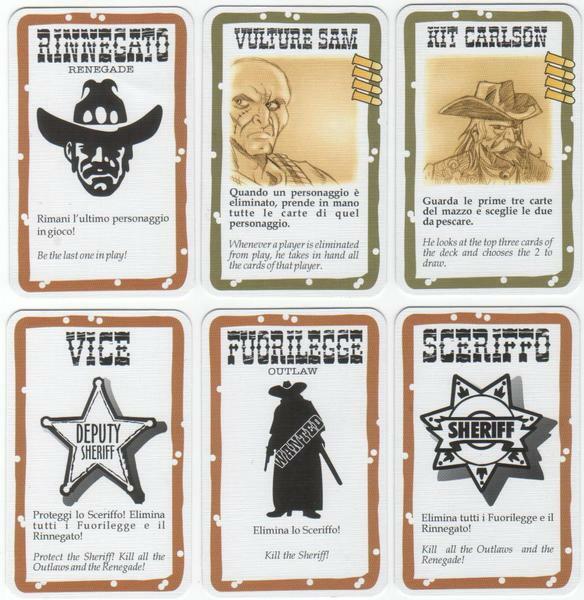 To begin players are given a role in the game, the number of Outlaws and Deputies change depending on the number of players. However, rest assured there will be at least one Sheriff, Outlaws and one Renegade in every game. Players are then dealt a Character card, the Character cards tell the player who they are and what special abilities they have for the game. These special abilities allow the player to either bend the rules or modify them with new rules that only they can use. After the roles and characters are handed out, the Sheriff introduces his role as the Sheriff and tells everyone what Character he is and what special ability he has. Going clockwise everyone else introduces what Character he or she is and the special ability they have for the game. The Character cards also tell the player how many Bullets they receive for the game; Bullets are life in the game. The Sheriff gets one extra Bullet just for the pleasure of being the Sheriff. Players then receive cards in relation to their life, if they have 4 Bullets they receive 4 cards. The number of Bullets a player has is the number of cards they may have left over in their hand at the end of their turn. On a players turn they will draw two cards and then play as many cards as they can in their hand. The only caveat to this is that they may only play one of each type of card, unless they have a special ability on their Character that allows them to modify that ability. For example, Will the Kid Character card allows that player to play as many Bang cards as he/she has. The main way to attack the players is with the Bang card. It should be noted at this point that the game has a distance mechanic. That is players can only shoot other players who are within their shooting distance. Shooting distance is how many seats away from you the player you want to shoot is from you. This distance is shown by your gun you have in play. It should be noted at this time also that cards come in two different color borders. Blue border cards are equipable cards that stay with your character, for example weapons. Green bordered cards have an immediate effect like a Bang card. When a player plays a Bang card they play the card on the person they are shooting. At this point, the player being shot at may played a Missed card to avoid taking a hit or they must lost a life and remove a Bullet. Some examples of other cards with instant effects are Beer, the card allows a player to regain one Bullet (Life.) There is a Duel card that allows you to stare down another player in a duel, first person who cannot produce a Bang card will lose one Bullet. Players can also place other players in Jail! Then there is the dreaded Dynamite card which will be passed from player to player to see who it blows up on, resulting in a loss of 3 Bullets to the player. When a player loses their last Bullet they are dead and now must reveal their role and discard their remaining cards. 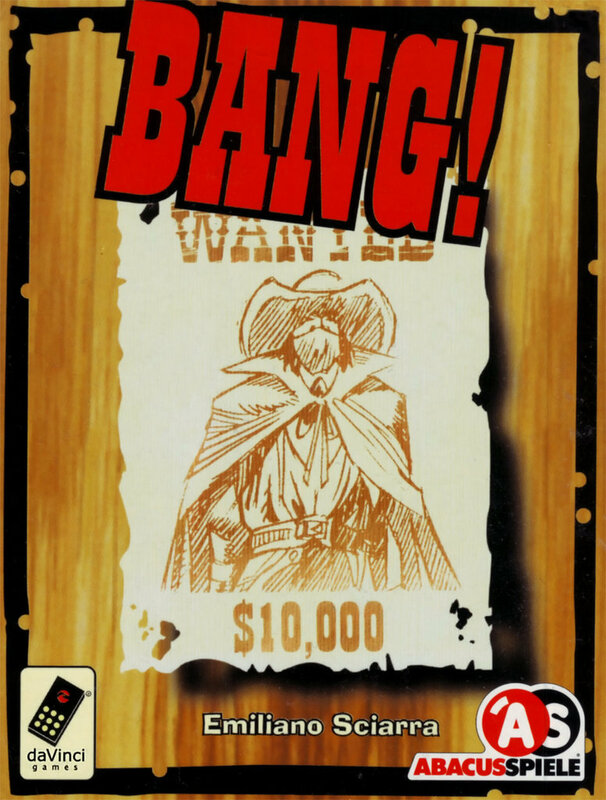 The game continues until either the Sheriff is killed or all the Outlaws and Renegade are killed. Bang! is a great party game that really gets people into the theme of the game. One of the best parts of the game is introducing your Character to everyone; this one little simple aspect of the game manages to put people in the feeling of a western. In addition, it never gets old in a game of Bang! to scream BANG, every time a Bang card is played. Little touches like that really make you feel like you are in a western staring down the bad guys. Not to mention it’s fun to yell Bang! from time to time. Bang! is a great party game, also a great opening game to get a great night of gaming going. And it really works as a fun family game, although I will warn you that the younger ones will have a tough time keeping their roles a secret, still the game is fun nonetheless. The other aspect I really love about the game is the deduction aspect of the game. It is very satisfying to make assumptions, play on those assumptions and find you were right. It also is devastating to find out you as the Sheriff have killed your Deputy leaving yourself along to fight the Outlaws and Renegade. The only drawback I could point to is the amount of players you need to play. Getting 4 players together can be a drawback to some people. If you are looking to pick up the game, I recommend Thought Hammer (and no I’m not getting commission.) Alternatively, you can peruse Google Shopping. Funny how life takes you on a journey, and one day to the next you never know where that journey will lead you. I am back to share my insight into the joys of modern day living. A while back, I brought up the subject of texting and then law making. As I explained there, one of the problems we face with lawmakers is the fact that those who pass laws are fallible themselves and we must be slow to passing laws. Not only does society have the problem of leadership fallibility but a question of leadership itself. In addition, when you add the quick nature modern society is changing as it adjusts to current changes, you have a recipe for problems to arise. 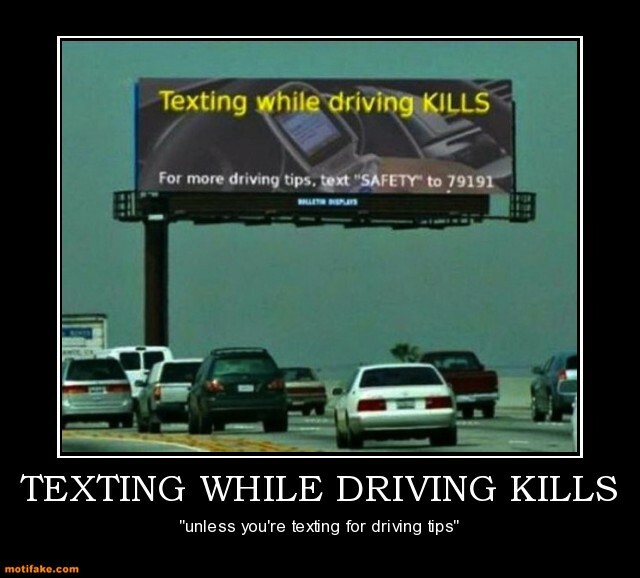 California was one of the first to pass an anti-texting law. And as usual people applauded the move and many guaranteed lives would be saved. However, a funny thing happened, the laws did not work. Not only did they not work, they actually increased accidents. Researchers examined data from California, Louisiana, Minnesota and Washington in the months preceding and following the anti-texting implementation. In three of the four states, the number of accidents caused by distracted driving actually increased. And this correlation may be blamed on drivers between the ages of 18 and 24 — 45 percent of this demographic admit to texting in spite of the bans. And in all four states, the number of crashes involving these young drivers increased. As I have said many times before the problem is not one caused by a single distraction, but is caused by drivers who are not properly trained to drive with distractions. Moreover, what leaves this writer scratching his head is why we needed a law, when we have distracted driving laws on the book. Nevertheless, more states followed and more whack-a-mole laws became statutes. Moreover, as I pointed out before the laws were thinly thought out legislation that did not think of changing technology. In fact, the legislation seem to only look at the negatives of technology versus their positives. As pointed out before, safety innovations in automobiles coming from technology are going to save more than kill. Therefore, it should come as no surprise when this news item popped up on my horizon yesterday, but sadly, it did. Starting Jan. 1, cops will allow you to send, dictate and listen to text messages while driving, but only if you’re using a separate, voice-activated device that’s connected to your phone — something like a headset or Bluetooth earpiece or a program inside your car like OnStar. Just turn on the device, say “text mom” and talk out the message. If your mom is driving, her earpiece will blurt out the message. On Friday, after much head-scratching and acknowledging nobody in (Assemblyman) Miller’s office owns a Siri-equipped iPhone 4S, the assemblyman’s aides concluded it will still be illegal to use your actual phone to text behind the wheel — even by speaking the message directly into Siri.